Do you know the difference between binge eating and overeating? If you occasionally overeat and the habit is becoming more frequent, you may be concerned that your habit has crossed over into unhealthy territory. Here is how to tell what is binge eating and what is overeating. Binge. The word is often used to describe an episode of heavy drinking. However, it can also mean something different when the substance that is over consumed is food. 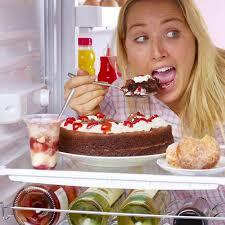 In some situations binge eating can be considered an eating disorder, called binge eating disorder. Binge eating disorder can be managed with treatment. Binge eating disorder may occur in the presence of another eating disorder called bulimia nervosa. But binge eating disorder can also occur on its own, without bulimia nervosa being present. Episodes of overeating that are classified as binge eating can significantly and negatively impact your health and well-being. So it is important to identify the signs and symptoms of binge eating disorder to get help if necessary. So how do you know if your overeating is just an occasional “blip” of overindulgence or a serious issue? 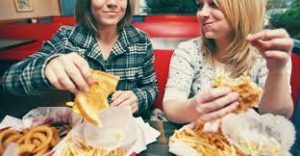 Some health experts may refer to an occasional food binge as “benign binge eating” or “everyday overeating.” They may consider the isolated episodes to be normal. But if a habit of binge eating starts to have a significant impact on your life, it should be cause for concern. Susan Cowden, M.S. is an eating disorders expert and provides professional information about how binge eating is diagnosed. This resource may help you determine if your overeating might be considered a disorder. A larger amount of food is consumed at one time. The binge eater feels a loss of control. Those who have a binge eating problem often say they feel a loss of control over what and how much they eat during an episode of overeating. 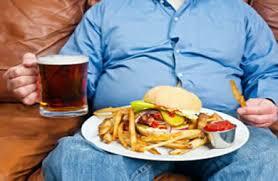 Some binge eaters say they feel driven to eat as if it were a compulsion that cannot be ignored. 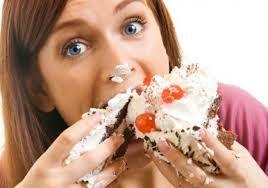 Other characteristics of binge eating include eating more rapidly than usual and not chewing food completely. Some binge eaters consider food more important than other aspects of their lives and may hide food to eat in odd places, or even steal food from others. What Is Overeating and What Is Binge Eating? There are no set guidelines for how much food is too much to be considered “normal” overeating. If you overeat on one occasion or a serious of occasions, you may want to ask yourself a few questions. Am I eating an amount of food larger than what most people would eat under the same circumstances and in the same amount of time? How do I feel after I overeat? The feelings binge eaters experience during and after overeating range from intense pleasure to disgust. This is another key difference between overeating and binge eating. The sense of disgust does not make a binge eater stop eating while an overeater listens to that voice. The binge eater feels she simply cannot stop. In general, binge eaters tend to eat more often than those who experience the occasional bout of overeating. Note, however, that continually snacking throughout the day (grazing) is not considered binge eating. If you feel that your eating habits are unhealthy, there is good news. Cognitive behavior therapy has proven very effective in helping binge eaters. There is also medication available to treat binge eating disorder. Ask your doctor for advice, or look for professional help in your community. By finding a qualified counselor, such as a licensed clinical social worker or psychologist, you will take a huge step toward gaining control of the problem. To find a qualified counselor in your area, visit the American Psychological Association website.